Panel made up of Ina Verstl, Prof. Dr. Fabrizio Bucella, Pete Rowe, moderated by Paul Walsh. Beer writers have progressed greatly since "it's to style". One thing that Ina doesn't like who say they don't like a particular beer, they should describe it but not give their opinion. Keith says that criticism is fine. A numbered review is just a hint towards the beer review says Fabrizio. Beer reviews or beer stories? Is there a half-way house? Keith says that he pulls in all sorts of beer-related content: reviews, stories, recipes for home brew, etc. The beer community seems to have more social media awareness than other alcohol-related communities. "Top 10 best X" posts get great click through rates on websites but are they any good? (Mixed reaction from the audience). Craft beer blogs - can you define a niche from this or are you deriding the whole brewing industry? 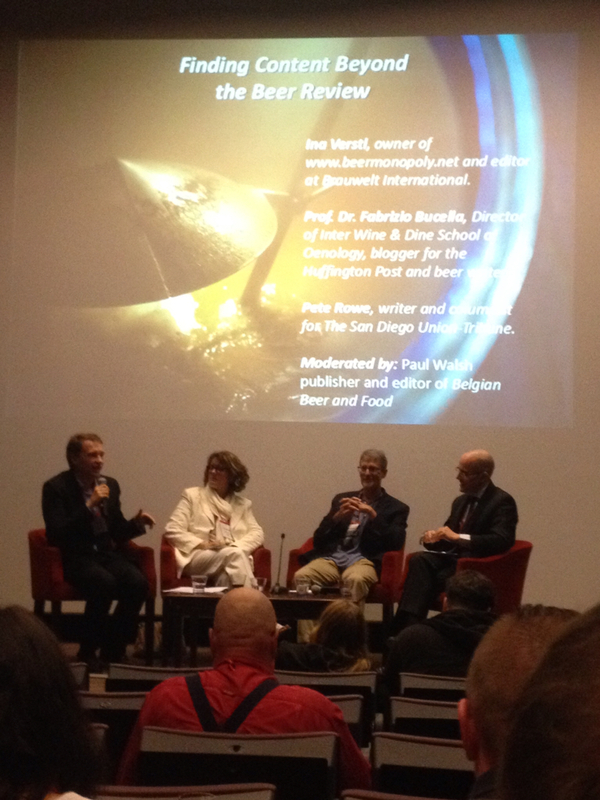 Ina says that they are all linked, families brewers can't exist without huge corporate brewers and visa versa. Larger breweries have huge marketing budgets to help promote new beers or creations whereas smaller breweries don't have that 'voice'. Bush brewery beer is available everywhere in Belgium and their normal beer would not be considered craft whereas they also do a limited edition special beer which could be considered craft - so are they craft or not? says Fabrizio. When a brewing behemoth is pretending to be a small craft brewery maybe they should be called out on that? says Pete.